The Passionate Programmer is actually a second edition book; the first edition was entitled My Job Went To India (And All I Got Was This Lousy Book): 52 Ways To Save Your Job. Big improvement already! 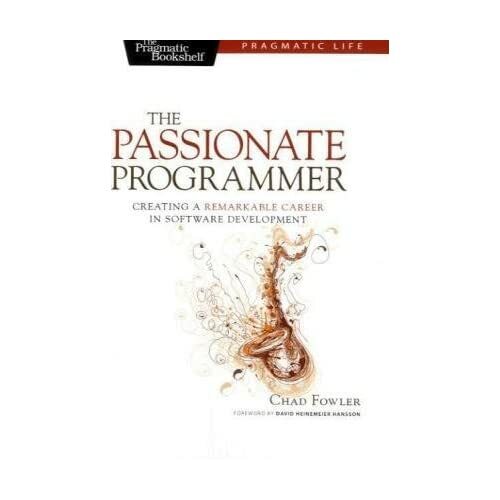 The Passionate Programmer’s subtitle is Creating A Remarkable Career in Software Development. Through 53 short chapters, Chad Fowler inspires readers to do better and go further in our careers. Chad was a jazz saxophonist before making a change to software and his book illustrates many connections between the two fields. One point that stuck with me is practicing. Musicians obviously have to practice a lot before they get on stage and perform. Chad says developers should practice as well, before getting on the “stage” of delivering for a customer. He recommends doing your own studying, such as learning regular expressions or APIs that you are unfamiliar with, to increase your chops. Open source project work is an excellent way to gain experience implementing features, studying the code of other contributors of the project, and getting feedback by having your contribution reviewed. The book is divided into five parts: Choosing Your Market; Investing In Your Product; Executing; Marketing… Not Just For Suits; and Maintaining Your Edge. Choosing Your Market focuses on planning your career by taking a high level view of the landscape and positioning yourself for maximum benefit. Investing In Your Product gives advice on how to improve your skills. Executing talks about the daily grind and how to make work more productive and enjoyable. Marketing is pretty self explanatory, giving some great advice on communicating how great you are to others. Maintaining Your Edge tells you how to avoid becoming a one hit wonder. One topic that resonated with me was Chapter 36: Being Present. Chad talked about his time as CTO of a software development center in Bangalore, India and his troubles being so far removed geographically from the rest of the management team. His performance review mentioned a lack of “presence”, which is pretty obvious problem when you have such a hard time communicating with your managers. He relates this to coders’ sometimes antisocial tendencies to hole up in the cubicle and get into “the zone” of programming. This is an issue for us at Blackstone sometimes, because of the distributed nature of the projects and client sites. Maintaining that presence in the community of Blackstone is difficult but very important for both management perceptions and being able to leverage teamwork to achieve great things. A few points in this book tied in tightly with the direction I feel Blackstone’s Company Contribution evaluation has been heading. Chapter 38: Change The World advises “Have a mission. Make sure people know it.” Chapter 42: Remarkability talks about doing things significantly different than those around you to be remarkable, such as releasing open source software, writing books and articles, and speaking at conferences. It’s not enough in this field to show up to work on time, write code on schedule and fix bugs quickly. Keeping up with the technology wave is important, but the ultimate goal should be to get out in front of it and show everyone a new way to go. In the acknowledgments, Chad Fowler admits a huge debt to Dave Thomas and Andy Hunt’s great 1999 book The Pragmatic Programmer, which kicked off their entire book line. Both books contain a lot of great tips wrapped in short chapters that I will come back to frequently. I consider both to be essential and valuable, providing quick inspiration to improve both software and my career.